I was lucky enough to be invited by Thompson & Morgan, to an exclusive 'Blogger's Afternoon', earlier this week. There was a small, but perfectly formed, group of us garden bloggers and social media users, all looking forward to meeting the new T & M plant introductions. To be honest, it felt a bit like being in a version of Roald Dahl's 'Charlie and the Chocolate factory' ! In the book, Willy Wonka showed a little group around his factory and demonstrated the marvels that lay within. The world within the factory walls was ablaze with psychedelic colour and brilliance, with novelties which seemed to defy logic, such as gobstoppers that last forever. Now, at T & M , we were confronted by similar conundrums... such as Gazanias which never close whatever the weather! That certainly defies nature as far as I'm concerned. I once grew Gazanias, once and once only, because the summer was so lousy that I never saw the colour of the petals, as the flowers remained sulkily closed. 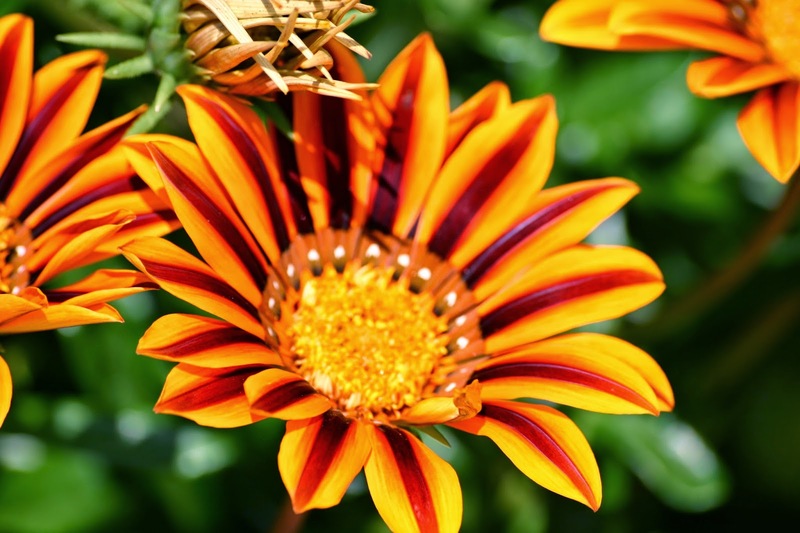 The new Gazania we were shown spits in the face of cloudy days, and keeps its petals wide open whatever the weather. Whilst Gazanias don't do it for me, and are not a plant I would grow, as they feel too spiky and artificial, I can see that ever-open flowers are a definite plus point ! 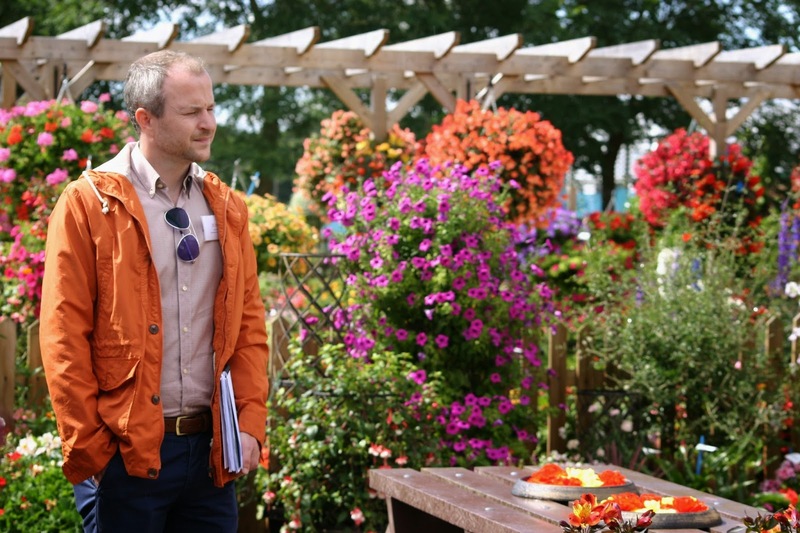 Our very own Willie Wonka (aka Michael Perry, New product development manager) gave us an insight into the new flower varieties, showing us around around the rivers of technicolour plants at the T & M Trials Ground. I think I was definitely the 'Grandpa Joe' character, (if we are sticking to the 'Charlie' analogy) and could be heard muttering softly, "I've heard tell that what you imagine sometimes come true." Willie Wonka gave the literary world cows which produce chocolate milk, whereas the 'Oft-alluded -to - but - never - seen - Charles' at T&M, designed cosmos wearing a ruff. A Tudor cosmos. 'Sexmos'! Does the world need Tudor Cosmos ? While the answer must be 'no', it is very pretty. As Willie Wonka invented a 'hot ice cream for cold days' so the boffins at T & M have devised the teeny, tiny Buddleja 'Buzz'. It grows to no more than four feet, yet flower spikes are comparatively large. 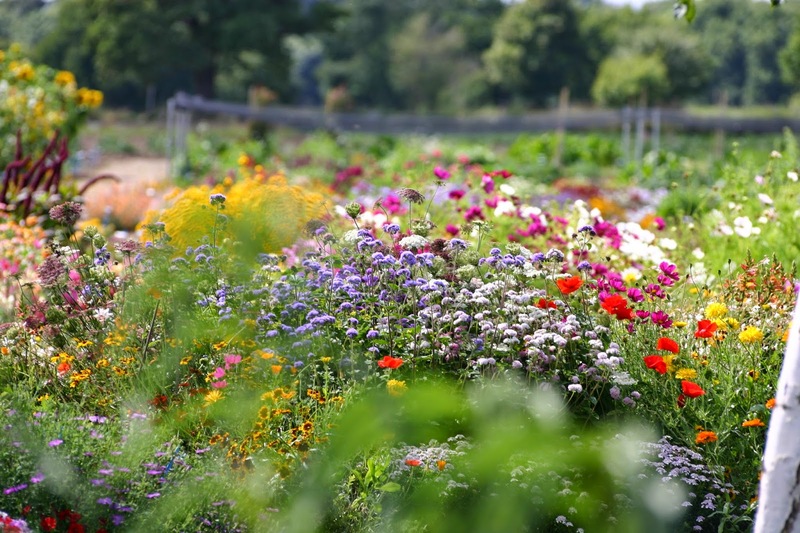 As these plants are sterile, the question was raised about its usefulness as a source of nectar for pollinators. There is proof in the photo below, and I know that they attract butterflies as much as their larger siblings, as I have four baby Buzzes in my own garden which are pollinator magnets. New introduction is 'Buzz Indigo', with dark, purplish blue flower spikes. 'Square sweets that look round' figure in 'Charlie and the Chocolate factory', whereas T & M have magically shrunk down a Eucomis to cute Patio size. 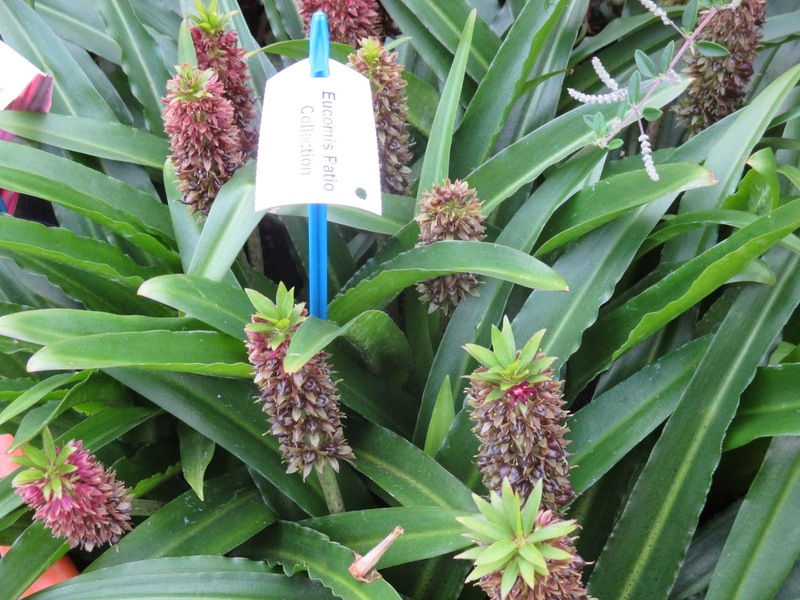 Called, erm, 'Eucomis Patio Collection' they would sit happily in pots, or at the front of the border. I think they could be a useful addition to the family. As Willie Wonka invented edible marshmallow pillows, so T & M continue on their quest for the Holy Grail of the vegetable world, varieties which are attractive in their own right, as well as edible. 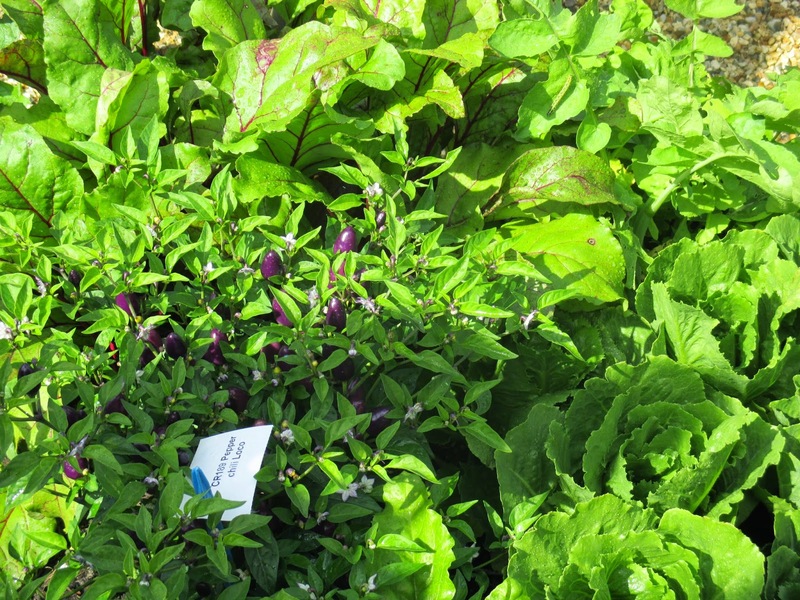 Chilli 'Loco' (below) ticks lots of boxes, as it is certainly attractive with its bushy, compact habit and its purple chillies which are highly ornamental. It was growing outside and was clearly happy to be out in the elements. But how does it taste ? The jury is out on that one ! It was described by Kris as being mild in flavour, but when eaten raw, packed quite a kick (as testified by certain members of the group!) Clearly its impact will change after cooking. Willie Wonka gave us chewing gum that never loses its flavour, whilst T & M gave us the magnificently named Petunia 'Johnny Flame'. The name alone sold me, as it could be the name of a frontman in a retro rock 'n roll band. It is definitely rain resistant, as the photo shows it after very heavy downpours, and it has the most beautiful velvety flowers. It is one I will definitely be growing next year. What an amazing colorful place ! Beautiful pictures ! It was such a lovely afternoon Ela! What a fun opportunity! 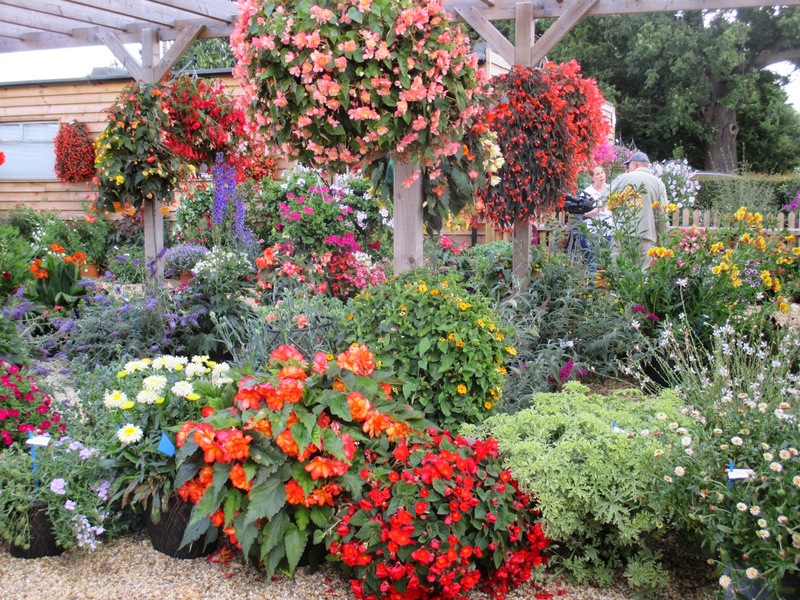 Fascinating array of plants, even if you wouldn't necessarily put them in your garden. Did you see any Oompa Loompas? I may have spotted one, under the Buddleja! It was a fascinating array and it was also interesting to see how they performed out there in the elements. TY for the tour! The new Cosmos is beautiful and the Petunias are an annual I really love. The weather looked perfect. I'm going to use restraint mentioning the gentleman in the plaid pants.....However, he is my idea of eye candy.....I might of had a hard time noticing the plants! After looking at other comments, I can see that you are not alone in that Flower Freak! Try to concentrate on the PLANTS ! Aw shame ! It would have been so good to meet in the real world as well as the virtual one ! Are you already growing the Begonia Rex which is hardier than others - 'Garden Angels' ? It still needs lifting but would at least, cope with colder weather. 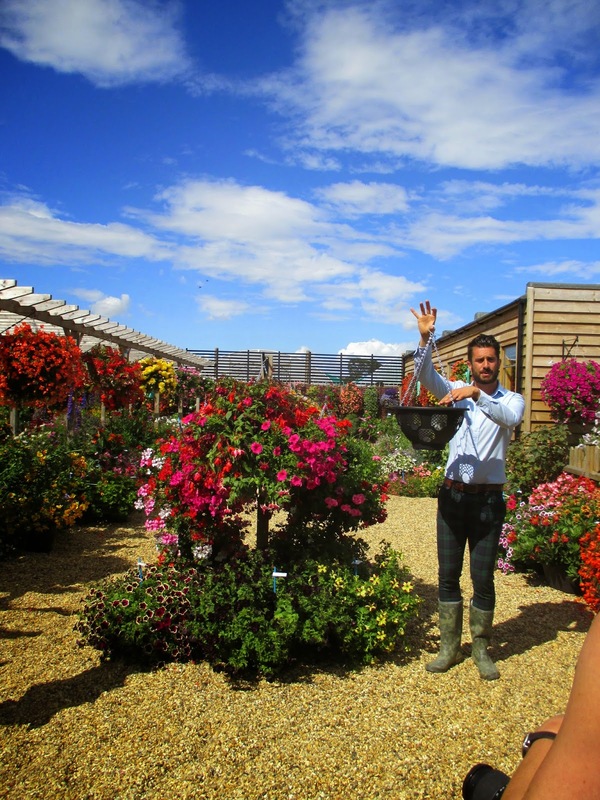 I couldn't concentrate on the flowers as I was too taken by that gorgeous man in the tartan trousers and gumboots. Sounds like it was an interesting day. Hi Elaine, it's all about the flowers !! 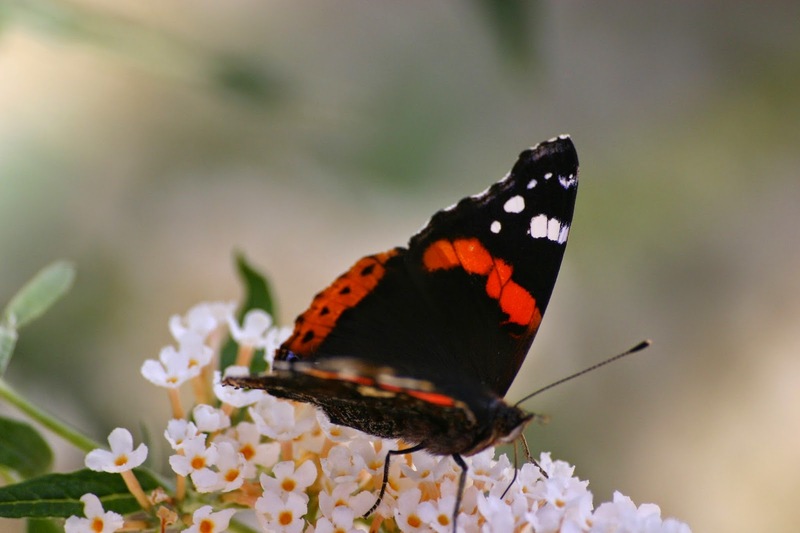 My favourite picture is the butterfly on the buddliea. I like your comparison to plants using Charlie and The Chocolate Factory; most clever. Hi Julie, thanks for your kind comments ! How lucky were you to be invited? When I read the title I was thinking James and the Giant Peach and expecting a bountiful peach harvest. 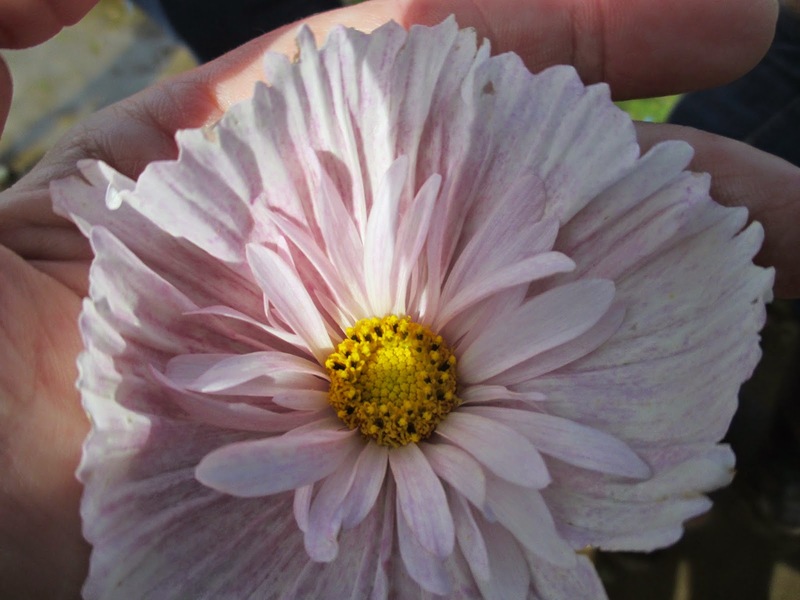 Just a thought - if flowers close in the rain to protect themselves does the rain damage a flower like that which has been bred to stay open. S bot like stopping a person blinking when something endangers the eye. I was so delighted to go! No, no peaches, just one shrivelled little apricot ! In answe to your question - I haven't a clue!! Gazanias open in sun, and usually close when it is not shining, so I presume they are usually shut in rain! I wonder Sue . It seems logical doesn't it. I need my sunspecs, there is so much colour! You certainly had a bright and colourful visit. A great post about what sounds like a fun day. The Cosmos is pretty and the little Eucomis would be lovely for a pot. Hi Chloris , it was a fantastic afternoon! I thought that the eucomis would look good in a pot. 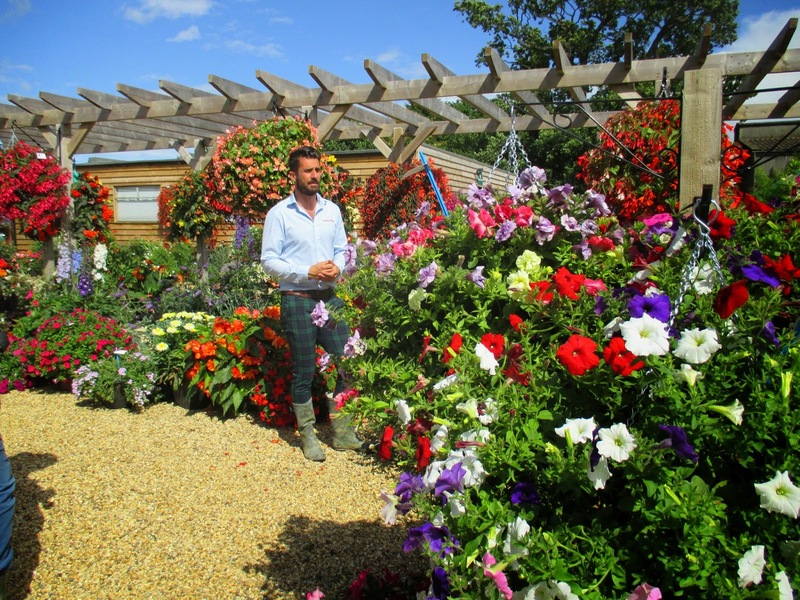 But what a gorgeous man to have stuffed those plants with! It might have been hard to focus on the plants. Bright it certainly was. Whilst most of them are not my types of plants, I can appreciate the colour they bring to any garden. Great post Jane. 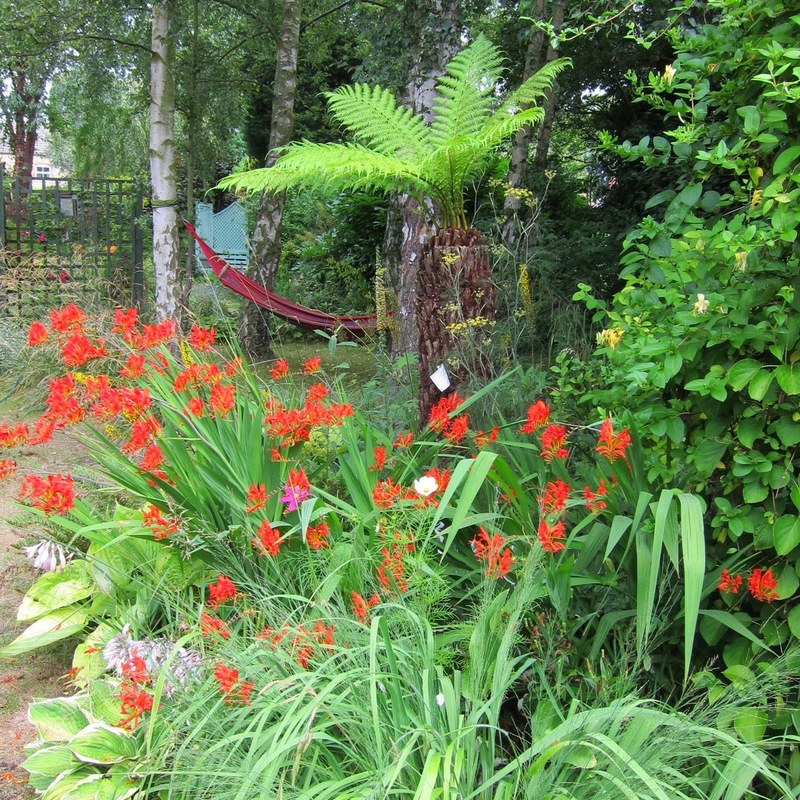 The plants look wonderful grouped together in their masses like that! 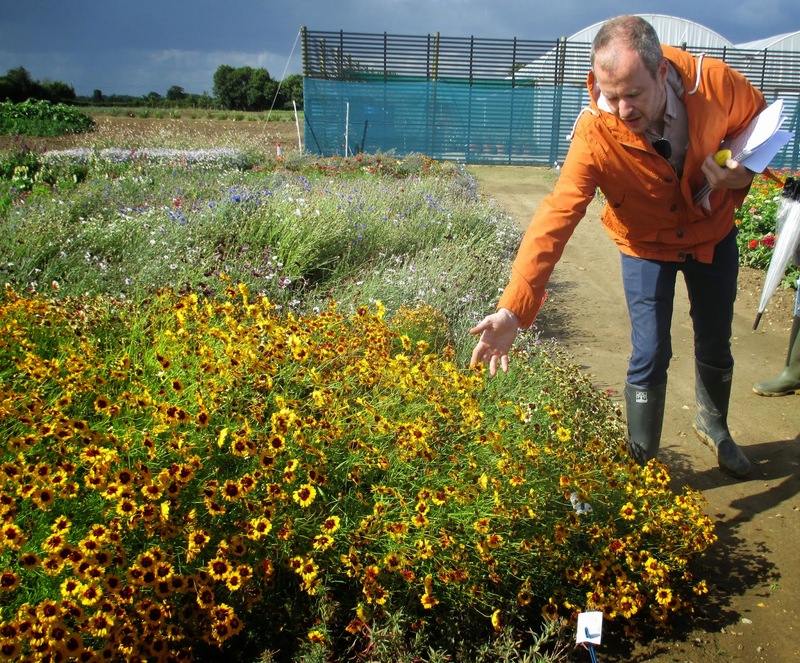 It's good to get an insight into the work that goes on with plant development. I have Buddleia Buzz too and mine has also been swamped with butterflies this year, I certainly wouldn't have room for a full Buddleia, so this one was a boon for me. Hi Paula, it was really interesting to see how the trials are run, I also found it quite reassuring that even T & M have their failures and disappointments too ! I rather welcomed the searing dose of colour of this post Jane, outside all is drab and grey! I am frequently not a fan of the fussy side of the new introductions world, the cosmos being a case in point, but I rather like the look of that chilli. 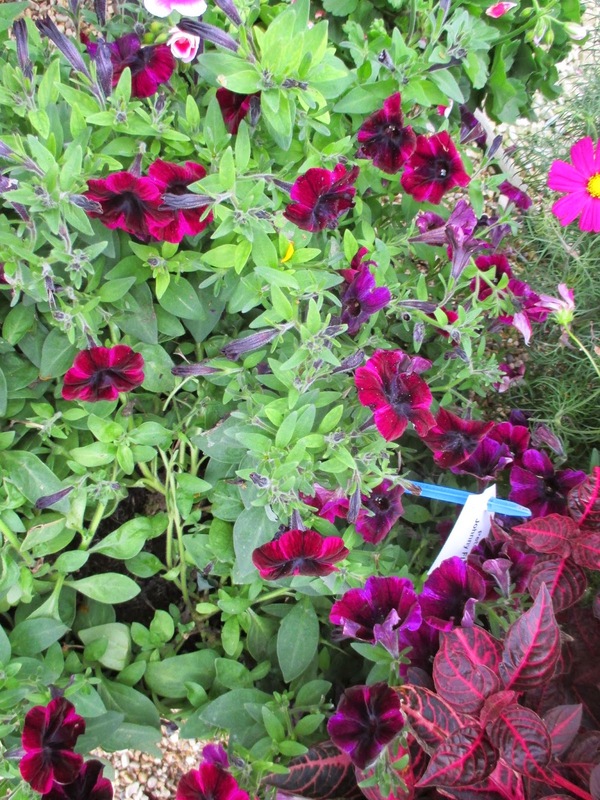 Do you grow 'Buzz' in pots or in your borders? Hi Janet, I know what you mean about novelty new introductions. I think they have to earn their place over the years, through their performance. The chilli looked excellent and well worth growing, for taste and for ornamental value, it is something I will be growing next year. I grow Buzz in the borders and have 3 or 4 different colours. It grows to a maximum of 4 feet, and as far as I can tell, performs as well as its larger siblings - and attracts just as many butterflies ! Parcel ... don't mind if I do !